Amatrol’s Robotics & Computer Programming System (94-RCP1) allows learners to gain skills in interfacing external devices, programming and operating robots, controlling production, and more. The 94-RCP1 will allow learners to practice and study how to identify robot and robot axis components, design programs for robots, explain how robots operate, developing workcells, and more. 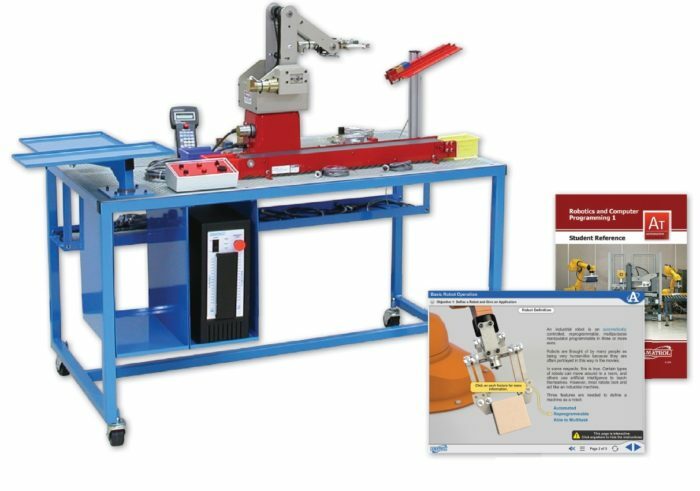 This robotics and computer programming system features Pegasus Robotic Simulation Software Integrated Workstation expand the capabilities of 94-RCP-1 Optional Flexible Manufacturing Learning System 1, 94-FMS-1 and more! Learners will use these and other components to practice programming, operating, developing, and controlling of real-world robotics and computer equipment. Amatrol uses components that learners will find on-the-job in order to give the best opportunity to build confidence and industrial competencies. The model 94-RCP1 includes an articulated servo robot, robot controller, teach pendant, programming cable, robot control software, flexible workstation, controller mounting module, keyboard and monitor module, utilities distribution module, electrical power module, compressed air distribution module, basic parts set, gravity feeder, application workcell package, robotic simulation software, robotic conveyor module, curriculum and instructor’s assessment guide. Learners will use these components to practice vital robotic and computer programming skills, such as: basic robot operation and programming, interfacing and material handling, application development, flexible manufacturing cells, quality and production control, and workcell development. Amatrol’s Pegasus Robotic Simulation Software allows learners to program and experience a virtual robot. Simulating test programs allows learners to test ideas without harming the robot. Simulation software also leverages hardware investment by allowing more than one learner to develop skills at a time. This learning system also includes Amatrol’s world-class curriculum, which combines strong theoretical knowledge and concepts with hands-on skills for the best industrial competency-building on the market. This thorough, exceptionally detailed curriculum, which is also available in an optional multimedia format, is built to begin with the basics and steadily advance to more complex concepts and skill. Amatrol’s Robotics & Computer Programming Learning System teaches learners skills that are commonly used by technicians, and engineers in today’s industry. Learners will gain expertise in key skill areas such as interfacing external devices, data outcome based control, conditional command operation, application development, and command operation, material handling control. Amatrol’s Robotics and Computer Programming Learning System 1 can be expanded and enhanced. In addition to the Robotics and Computer Programming Learning System learners can expand on their knowledge with the Flexible Manufacturing Learning System (94-FMS2) which can be added to the 94-RCP1. Learners study skills in linear motion, world and tool coordinates, ASCII data manipulation, palletizing, barcode readers, digital gauging, CNC workcells, serial communications, multitasking, and interrupts. These capabilities are commonly found in the current generation of industrial robots learners will encounter in industry. A sample copy of the Robotics and Computer Programming Student Reference Guide is also included with the system for your evaluation. Sourced from the system’s multimedia curriculum, the Student Reference Guide takes the entire series’ technical content contained in the learning objectives and combines them into one perfectly-bound book. Student Reference Guides supplement this course by providing a condensed, inexpensive reference tool that learners will find invaluable once they finish their training making it the perfect course takeaway.